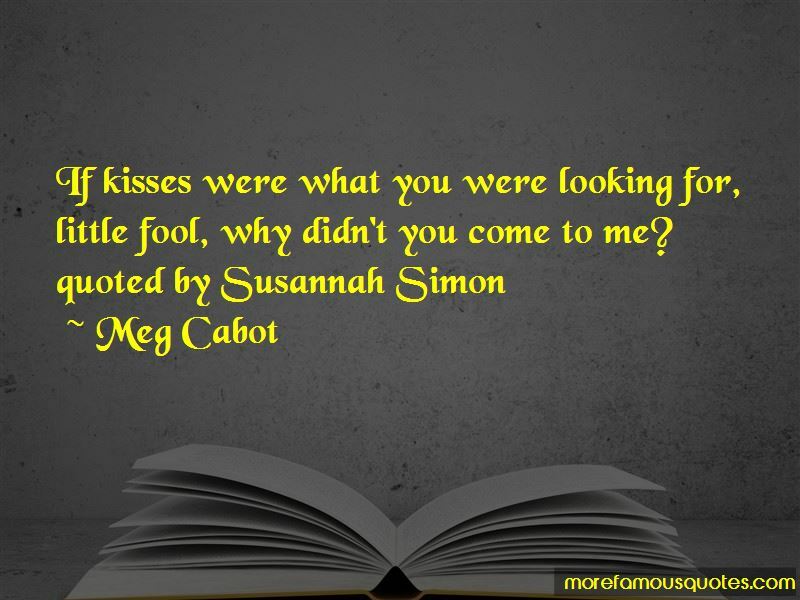 Enjoy the top 571 famous quotes, sayings and quotations by Meg Cabot. “I thought if you wore that, no matter what face you saw every morning in the mirror," he said in his deep voice, "youll never forget who you really are." My eyes filling with tear, I held my hand out across the tabletop. He grasped my fingers, his grip strong and reassuring. “I loved you way before you ever had a chance to put a spell on me. I loved you at 'I've never been to Long Island,'" Zach said. I couldn't keep a big goofy grin from my face. “I just want to let you know that when I look into my future, I see nothing but you." That's what Chaz had whispered in my ear at some point during the wedding last night. "Me?" My own voice rocketed up about ten octaves. "Me? Jesse, of course not. I would never do that. I mean, you know I would never do something like that. That kid Jack did it. Your girlfriend Maria made him do it. She was trying to get rid of you. She told Jack you were bothering me, and he didn't know any better, so he exorcised you, and then Felix Diego threw me off the porch roof, and Jesse, they found your body, I mean your bones, and I saw them and I threw up all over the side of the house, and Spike really misses you and I was just thinking, you know, if you wanted to come back, you could, because that's why I've got this rope, so we can find our way back. “Hey," Dopey said when I was finished reading. "How come they never mentioned me? I'm the one who found the skeleton." “What is the sound of one hand clapping? What is the weight of a single grain of sand? The answer is equal to my interest in the message you are about to leave so make it short. “IN THE SECOND GRADE, WHEN YOU ARE A BOY WHO LIKES A GIRL, YOU GIVE HER YOUR BEST POKEMON CARD. OR YOU PULL HER HAIR. NOT HARD ENOUGH TO MAKE HER CRY, THOUGH. “If kisses were what you were looking for, little fool, why didn't you come to me? “It wasn't me," Lars supplied, from the front seat. "I didn't tell." "Of course it wasn't Lars," Michael said, having overheard him. "Tell Lars no one is blaming him." “You know what you sound like? A jealous girl friend. “It wasn't until Hope fluttered over and landed at Alex's feet, peering questioningly up at him, that he finally tore his hands away from his eyes. "Oh, my God," he said, sounding disgusted. "Why is there a bird looking at me?" "That's Miss Oliviera's bird," Henry volunteered cheerfully. "The captain gave it to her as a present." Kayla punched me in the arm. "John's got his captain's license?" she whispered. "You are so lucky. Frank says he just loads cargo." “I thought if you wore that, no matter what face you saw every morning in the mirror," he said in his deep voice, "you'll never forget who you really are." I told them I wasn't crying. I told them my eyes were watering from all the marker fumes. And they seem to believe me. Too bad the only person I didn't seem able to fool anymore was myself. Observation point," he said, pointing to the wooden sign in front of us that said, OBSERVATION POINT. NO LITTERING. "A lot of kids come here on Saturday night." Micheal cleared his throat and looked at me meaningfully. "And park." I have to say, up until that moment I really had no idea I was capable of moving so fast as I did getting out of that car. But I was unbuckled and out of that seat quicker than you could say ectoplasm. Only a couple of people have figured out what a weirdo super freak I am on the inside. And those people all have a reason to keep my secret, because ... well, I've helped them resolve their own secrets. Don't ask me why. I think I'm fabulous, but I'm not entirely sure what he sees in me (except the fact that I've saved his life a few times. But he's returned the favor). Oh my God, I am such a liar. And I can't even leave it at just one lie, either. Oh, no. I have to pile it on. I am sick, I tell you. Sick. fluorescent lights and metal desks. Ten minutes until the bell rings. in the hearts of those we love? Five minutes until the bell rings. “Hello," Lilly said."Movie. Of your life.You were portrayed as shy and awkward." "I am shy and awkward," I reminded her. 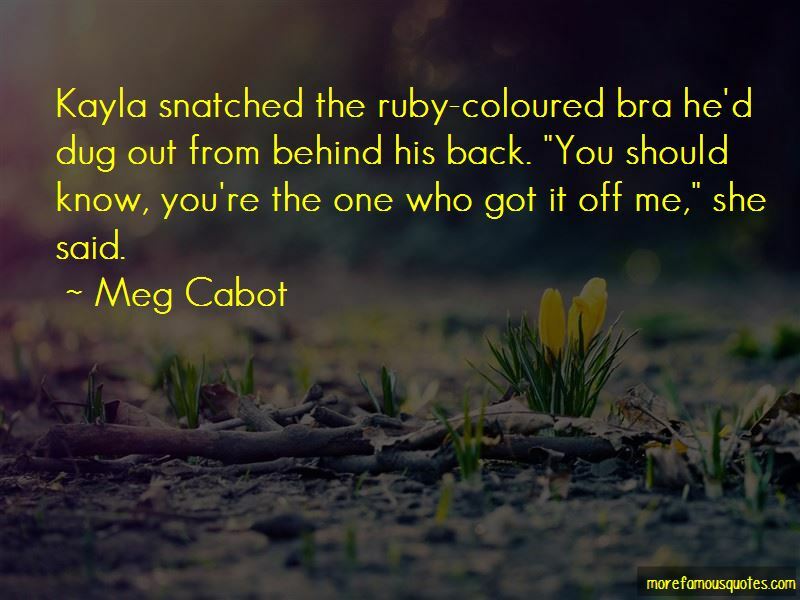 Want to see more pictures of Meg Cabot quotes? 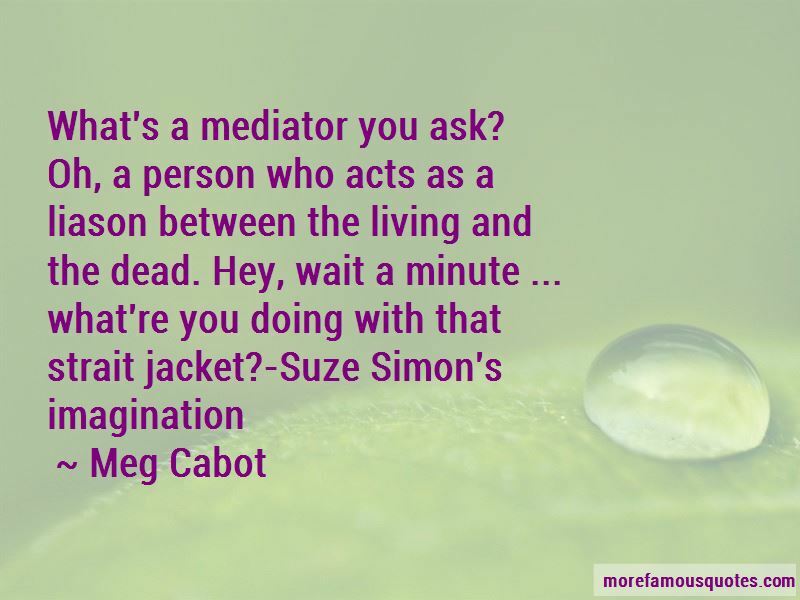 Click on image of Meg Cabot quotes to view full size.